How Do Doctors Treat Cold Sores Near the Eyes [Ocular Herpes]? » How Do Doctors Treat Cold Sores Near the Eyes [Ocular Herpes]? What Are the Symptoms of Cold Sores on Eyelids & Around the Eyes? 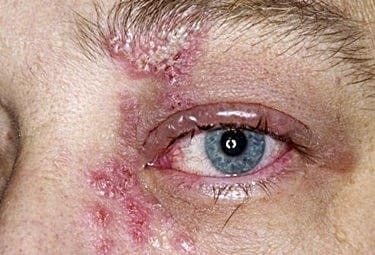 Eye cold sores are caused by the herpes virus. This is different from the virus that is transmitted through sexual activity. When the HSV-1 virus enters the body, it stays with you forever, but it usually remains in a dormant state. Cold sores can spread to other areas of the body, including the eyes and eyelids, through touch. There is a specific term for ‘eye herpes,’ called ocular herpes. It is contracted through the same virus that causes cold sores to appear elsewhere on the body. When it comes to this virus affecting your vision or the health of your eyes, it’s important to understand better how it’s contracted. Once you know a bit more about cold sores and the eyes, you’ll be better equipped to avoid spreading the virus. Ocular herpes is treatable. Unfortunately, once you have experienced herpes of the eyes, the chances of recurring cold sores remains high. That doesn’t mean it will often happen, or at all, but it does mean that it’s a possibility at any time if it’s triggered. There are a couple of ways in which your eyes can contract the HSV-1 virus. First, you become your own worst enemy. If you or another person has cold sores, it’s important that you avoid touching anywhere close to the eyes. As a precaution, wash your hands and towels frequently. Let’s say you touched an open or blistered cold sore. Then, you rubbed your eye. The chances of the virus spreading to the eye are likely at that point. You can also contract the virus in your eye from another person. The overall process is the same. Typically, it occurs through touch or exposure. If someone you know has a cold sore and you touch them, and the virus gets close to your eye, it could easily become infected. A headache with a fever. Cloudiness or swelling (or both) of the cornea. Redness or rash on the forehead, around the eyes, or on the nose. Pain when you look at a bright light. If you have a sensation of dirt in your eye. If tears continuously come out of your eye. In some cases, contracting the herpes virus in your eye can cause pain, especially if it irritates the cornea. It can lead to blurry vision. Because of these symptoms, it’s easy for even the most seasoned eye doctors to overlook the cause. So, if you know you’ve come in contact with someone with a cold sore, and experience these symptoms, let your doctor know immediately. Each of these problems affects different parts of the eye and each with varying degrees of severity. 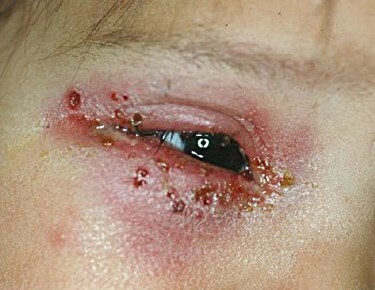 Herpes keratitis affects mostly the outer layer of the eye. Therefore, it is the easiest to treat. However, each outbreak should be treated on an individual, case-by-case basis. If you have a cold sore, that’s spread to your eyes, getting it treated quickly is imperative. If the infection is only minor, you may be able to treat it with eye drops, antiviral medication, or an ointment. If the virus has spread, it may be Stromal keratitis or Iridocyclitis. In these cases, your eye doctor may provide several different treatments. They may prescribe corticosteroids (steroid drops) for the eyes. They can help to reduce inflammation and pain. Typically, your doctor will put you on a regiment of both steroid drops and antiviral drops. An eye doctor may actually ‘scrape away’ cells of the infection from the cornea with a cotton swab. You’ll have to wear some eye patch or special lens to fully allow the eye to heal. Keep in mind that you should never wear traditional contact lenses if you have ocular herpes. Surgery may be required. This is only necessary if the cornea becomes scarred due to the virus. If cold sores spread to the eyes, it cannot ever be fully ‘cured.’ If you’re prone to the condition, your doctor may prescribe an antiviral medication as a preventative measure. What’s the Connection to Cold Sores? Both cold sores and ocular herpes are caused by the same virus. They are contracted from others with the virus through touch. The differences, you’ll find, are found in the symptoms. Cold sores around the mouth will show up as blisters that ‘crust’ over. If the virus spreads to the eye(s), you’ll notice the symptoms listed above. Treatment solutions, of course, are based on individual circumstances. Symptoms can frequently recur for some and rarely for others. Yes, cold sores can spread to the eyes, and they’re extremely contagious. They will go away on their own in several days (faster with the right treatment). During that time, do what you can to avoid spreading the HPV virus to your eyes, or to members of the family and work colleagues.